The statue depicts a female figure identified as a Muse, perhaps Erato. The character is standing on her left foot while her right leg is bent and slightly pointing outwards; she is clad in a peplum that rests open on the right arm, pinned on the shoulders with two buttons. The head is slightly tilted to the left and is framed by soft hair that split on the forehead and is gathered in a knot at the nape. Probably she held a lyra in her folded arms; in fact a short piece of the strap that supported the instrument appears at the back of her neck, along the hem of the dress. The sculpture must have been carried out at the beginning of the imperial period, even though the oval shape of the face, the high triangular forehead, the wavy hair falling softly on the forehead and the style of the drapery are features that recall the Attic art of the 4th century BC. 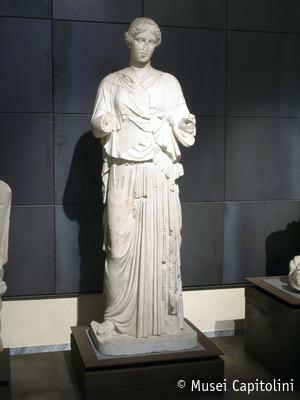 On the grounds of the similarities in the face and in the arrangement of the drapery, it has been suggested that the original work was one of the Muses that the sculptor Cephisodotus the Elder had dedicated on Mount Helicon in Greece. The sculpture was found in Rome during the excavations in the area of the Horti of Maecenas.